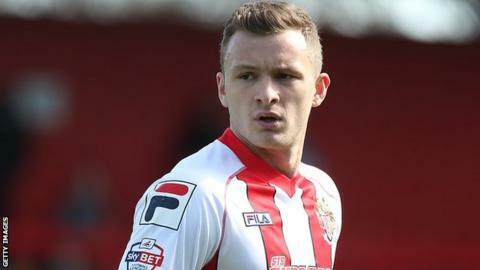 Stevenage's place in the League Two play-offs was confirmed thanks to a narrow victory over Carlisle. Dean Parrett's clinical finish from the edge of the box broke the deadlock, with the hosts having seen Andy Bond's first-half effort cleared off the line. Brad Potts wasted the Cumbrians' best chance to level, blazing over the bar, before Tom Pett hit the post for Boro. Graham Westley's side are guaranteed sixth place after six games unbeaten, while Carlisle remain in 20th. "In fairness we probably knew the play-offs would be there for us before today. We've been playing okay and been building towards those play-off situations. It wasn't a landmark for us really. "We came in today's game trying to be a better team than we have been previously. We showed a lot more composure in possession of the ball. We showed a lot more ability to play on game and stay on game. "It was good to see a goal crafted that we spoke a lot about in the week. We knew where their strengths and weaknesses were as a defensive unit and we managed to score a goal that, in the first half, didn't look as likely. "I was angry as we weren't attacking as we talked about attacking them. We did exactly what we talked about not doing. It was more frustrating than anything else." Match ends, Stevenage 1, Carlisle United 0. Second Half ends, Stevenage 1, Carlisle United 0. Chris Beardsley (Stevenage) wins a free kick on the right wing. Attempt missed. Jason Kennedy (Carlisle United) right footed shot from the centre of the box is close, but misses to the left. Attempt missed. Sean O'Hanlon (Carlisle United) header from the centre of the box is close, but misses to the right. Corner, Carlisle United. Conceded by Dean Wells. Corner, Carlisle United. Conceded by Bruno Andrade. Corner, Stevenage. Conceded by Sean O'Hanlon. Bruno Andrade (Stevenage) wins a free kick in the defensive half. Substitution, Carlisle United. Gary Dicker replaces Matt Young. Steven Rigg (Carlisle United) wins a free kick in the defensive half. Attempt saved. Dean Parrett (Stevenage) left footed shot from outside the box is saved in the top centre of the goal. Attempt blocked. Tom Pett (Stevenage) right footed shot from outside the box is blocked. Corner, Stevenage. Conceded by Danny Grainger. Attempt missed. Brad Potts (Carlisle United) left footed shot from a difficult angle on the right is close, but misses to the right. Attempt missed. Mark Beck (Carlisle United) header from very close range is close, but misses to the right. Substitution, Stevenage. Ben Kennedy replaces Dave Martin. Corner, Stevenage. Conceded by Mark Gillespie. Corner, Stevenage. Conceded by Patrick Brough. Attempt blocked. Chris Whelpdale (Stevenage) right footed shot from the right side of the box is blocked. Attempt blocked. Bruno Andrade (Stevenage) right footed shot from the right side of the box is blocked. Attempt missed. Brad Potts (Carlisle United) right footed shot from the right side of the six yard box is close, but misses to the right. Substitution, Stevenage. Bruno Andrade replaces Tom Conlon. Attempt missed. Chris Whelpdale (Stevenage) right footed shot from outside the box misses to the left. Chris Beardsley (Stevenage) wins a free kick in the attacking half. Attempt blocked. Tom Pett (Stevenage) right footed shot from the centre of the box is blocked. Substitution, Carlisle United. Steven Rigg replaces Anthony Griffith.